Are you interested in getting a new Alfa Romeo vehicle? Are you so enamored with both the 2019 Alfa Romeo Giulia and Stelvio, though, that you’re having a hard time figuring out which one is best for you? Don’t worry, we’re here to help! The 2019 Alfa Romeo Giulia and Stelvio are so popular and valuable, that many drivers struggle just choosing one, but we’ll help you pick the right one for you! In this model comparison page, we’re going to show you the key differences and similarities of the two most popular Alfa Romeo models, the 2019 Giulia and 2019 Stelvio. They have a lot in common, but they’re also very unique. Which one is right for you? Find that out, right here! Whichever you choose, rest assured you’re getting a tremendous vehicle! 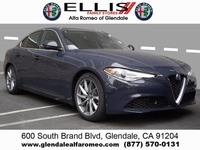 Test Drive the 2019 Alfa Romeo Giulia and Stelvio at Glendale Alfa Romeo in Glendale, California, Today! As you can see from our table of data, both the 2019 Alfa Romeo Giulia and Stelvio have a lot to offer! The two Alfa Romeo models share a lot of characteristics, including similar looking designs. The key thing to remember about the two, though, is that the Stelvio is a midsize SUV, while the Giulia is a four-door sedan. Obviously, that means that the 2019 Alfa Romeo Stelvio is going to offer more space than the 2019 Alfa Romeo Giulia, and therefore have a slightly higher starting MSRP. The two Alfa Romeo models, however, are still very similar. In fact, they both have the same engine, an All-Aluminum 2.0-liter Turbocharged 4-cylinder that offers plenty of power with 280 horsepower and 306 lb-ft of torque. Even though they both have the same engine the Stelvio, because of its larger size, has a slightly lower EPA-estimated combined fuel economy, but not by much. In many ways, the 2019 Stelvio is just a bigger version of the 2019 Giulia! Speaking of bigger, if you’re looking to get the performance of the 2019 Alfa Romeo Giulia but with more space for passengers and cargo, then the 2019 Alfa Romeo Stelvio is right for you! With a standard cargo space of 18.5 cubic feet that can expand to 56.5 cubic feet, the 2019 Alfa Romeo Stelvio has plenty of space for all your luggage for a weekend getaway or road trip! Want to learn more about the 2019 Alfa Romeo Giulia or 2019 Alfa Romeo Stelvio? 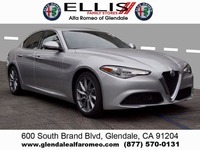 Contact our staff at Glendale Alfa Romeo for more information or to schedule a test drive today!